This summary is prepared within the framework of the project activities “Improving the participation of small(er) communities at local level” with the support of the Delegation of the European Union and INSOC in the period from 01.04.2016 to 30.09.2017 in five municipalities: Kumanovo, Kocani , Prilep, Bitola and Tetovo. The project activities aim to increase the possibilities for establishing mechanisms for improving the participation and protection of the rights of Roma and other smaller communities at the local level in accordance with the Ohrid Framework Agreement. The impact of the implemented activities is visible not only in the assessment of the needs of the members of the smaller communities, but also as a contribution to the creation of public policies for improving their participation and equal access to fundamental rights. 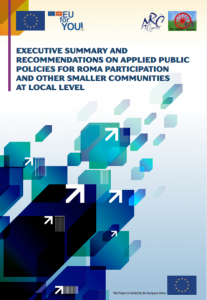 Findings in this summary show the disadvantages of improving the participation of Roma and smaller communities at local level and provide clear guidelines for further action to improve the participation of smaller communities at the local level. This publication has been produced with the assistance of the European Union. The contents of this publication are the sole responsibility of the Association National Roma Centrum Kumanovo (NRC) and the partner organization Association of Roma AVENA-Kochani and in no way can be taken to reflect the views of the European Union.